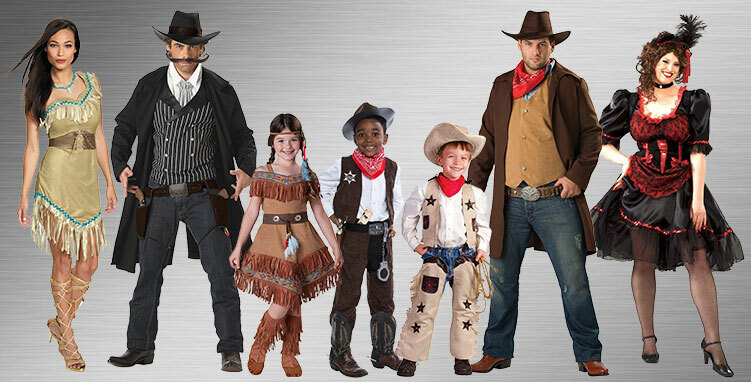 With this collection of Western, Cowboys, and Indians Costumes, you can get an amazing outfit for an exciting night of fun for everyone! Become native American princesses, dance hall girls, old west sheriffs, and lots of other cool characters to help your night of trick-or-treating and costume parties look amazing for kids and adults! Yee haw! 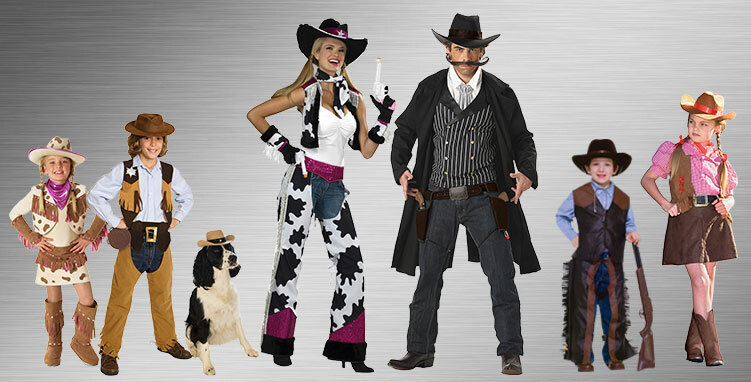 It’s a classic Western, Cowboys and Indians costume party! You’ll find everything you need to get ready all in one spot. No matter which side you choose, the perfect costume and accessories are waiting for you to wear and dazzle everyone you see. The gang’s all here with gunslingers, cowboys, the saloon gals, renegades and Native Americans. And don’t forget about the sheriff. 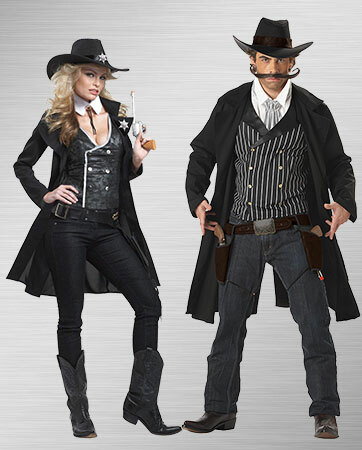 There’ll be no battles at this costume event as everyone joins in on the fun of the Old West. Get ready to say "howdy y’all" because you can bet your boots it’s going to be a great time with friends and family dressed up as their favorite western characters. You can be the good guy or the bad guy, or just the girl drinking at the saloon. Whichever you choose, it’s bound to be a perfect party! A strong and noble team, this Native American duo exhibits pride and knowledge unlike any other. 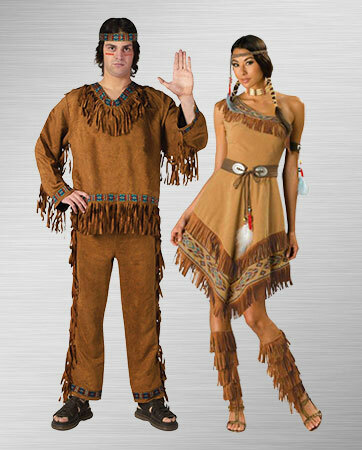 A classic couple costume, you two will stand out among the crowd in your traditional garb. Just make sure you have some exciting stories to really dig into your role. Combining style and seduction, this stunning burlesque number will have you feeling both feminine and feisty as you kick up your feet and dance the night away. Who doesn’t want to be the center of attention? You can have it all with the Ultimate Burlesque Beauty Costume. A gorgeous pink and black dress is complete with a built-in corset and stretchy lace to perfectly fit your shape. The black tiered skirt features pink ruffles that flow down around your legs. Finish off the look with a miniature plumed hat with a veil and a detachable pink bustle bow. You wouldn’t be a true burlesque girl without elegant gloves, so don’t forget about these elbow-length, black mesh fingerless gloves trimmed in a lovely pink. Don't be afraid to strut your stuff when you have this amazing outfit on! 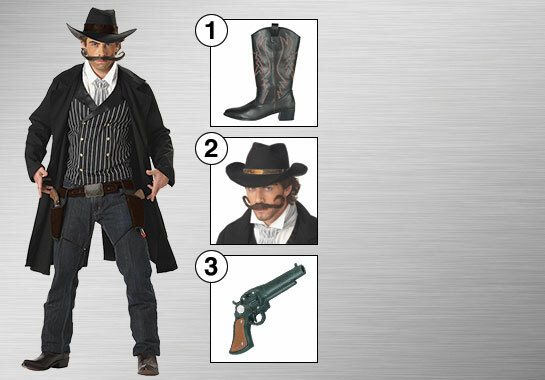 Dress up as the most dangerous villain in the Old West and spook your fellow costume party guests. Even though you can’t bring your horse, you can impress everyone with your costume skills when you have the full gunslinger ensemble down. Black, authentic-looking cowboy boots go perfectly with your dark getup, making you look super stylish for a night out on the town. You’ll feel like a true bad guy in these heeled beauties. You’re not a gunslinger without the signature moustache. Get ready to cause some chaos with your lawless ways the moment you put this on your face. Jesse James is no competition for you. You’ll always have the quickest draw with this over-sized cowboy gun. It’s the sharpest looking six shooter in the Old West. Whether you’re robbing banks or stealing horses, this cowboy gun will do the trick.